Definition of a hangover: Wrath of Grapes. Many of us will have made our new year’s resolutions to give up wine, cigarettes or chocolate. Not wanting to deny myself any of life’s little luxuries I have decided instead to resolve to keep up the diversity in construction blog this year and I need you help to do it. Often when giving talks, meeting clients or exchanging emails I am asked an wide variety of questions regarding equality and construction. I have therefore decided to use the blog to answer these on a monthly bases, the rules are straightforward and you can find them on this month’s blog. So please support this and ask away I’m looking forward to a couple of tricky ones! The Department for Work and Pensions announced that women who would have seen a two year increase to their state pension age will have their wait reduced to 18 months. The Pensions Bill currently going through Parliament will be amended from the current timetable to cap the increase at a maximum of 18 months. The Women into Construction Project is building on its success on the Olympic Park, where it demonstrated that there are many women who are highly motivated and keen to find opportunities within the construction sector, and that they have a positive contribution to make once brokered into placements and employment. 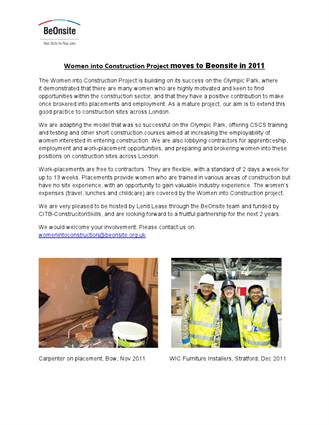 As a mature project, the aim is to extend this good practice to construction sites across London adapting the model that was so successful on the Olympic Park, offering CSCS training and testing and other short construction courses aimed at increasing the employability of women interested in entering construction. We are also lobbying contractors for apprenticeship, employment and work-placement opportunities, and preparing and brokering women into these positions on construction sites across London. Whilst not directly related to the built environment this area is still so niche that any best practice is welcome, the government have outlined their transgender action plan here, it’s worth a look. The Princes Trust are currently recruiting for their ‘Get Into Construction’ programme, delivered with the National Construction College. The programme is open to young people between the ages of 16 to 25 who are unemployed and live in one of the Greater London boroughs. The government wants to know your views on employment tribunals currently being funded by the tax payer. We feel this is an important service that helps to regulate large employers and in times of even greater uncertainty it’s a service that, unfortunately, only becomes more necessary. Please do take the time to respond to this, even if you feel the funding should be abolished an informed debate is always the most relevant. This recent European Court of Justice ruling which will come into force in Dec 2012 is likely to drive insurance premiums up for women whilst remaining static for men. It’s a point that can be argued both ways but for now let’s consider what it means to our businesses and if you feel it would have a significant impact as an SME or large employer do respond to the consultation and make yourselves heard. The Consultation document seeks views on the Government’s legal interpretation of the judgment and the accompanying draft regulations that amend the Equality Act. It also seeks comments on the Government’s impact assessment and requests additional data that would contribute to a better understanding of the impact on consumers and insurers. This report from 2009 is on Promoting Diversity - Power of procurement, so its not as up to date as we would like but since its the first we’ve seen of it there’s not much we can do about that. The reason it’s snuck under the radar is that it’s not aimed specifically at construction, the reason it get a mention is the strong case studies from both Balfour Beatty and the housing sector. Having interviewed and awarded Balfour Beatty the award for best Equality and Inclusion programme on the Olympics I would recommend you read. whilst everyone needs to continue moving forward we were certainly very impressed with the steps they were making. 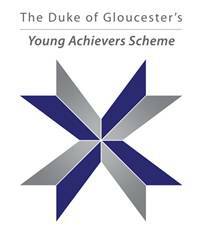 This brand new awards scheme, organised by Construction Youth Trust with the support of their Patron, HRH The Duke of Gloucester, aims to identify and celebrate the success of exceptional young professionals working in the built environment. It was great to see that applicants were from a diverse short list with representation from women and the BME community but more importantly an award for young proffesionals in industry is long over due and we would encourage the industry to get behind the scheme. That this year's winners are Neil Quinn of BSK CiC for Architecture, Thomas Hilman of Taylor Wimpey South Wales for Construction & Project Management, Chloe Agg of WSP CEL for Engineering and Brendan Cusick of Sir Robert McAlpine for Surveying and the overall winner award. We have received this call for male or females working in industry to undertake a survey looking at women in industry. All students, architects, clients, consultants, charities and those working in the greater architectural industry: please take the Women in Architecture survey and help Architects Journal collect data on the gender gap in the profession. They ask about pay, discrimination in the profession and work/life balance. All answers anonymous and will contribute to their 12th January Women in Practice issue. Can you help with research investigating the motivations and career intentions of engineering and technology undergraduates. This survey is funded by the National HE STEM Programme which supports Higher Education Institutions in the exploration of new approaches to recruiting students and delivering programmes of study within the Science, Technology, Engineering and Mathematics (STEM) disciplines. The survey is part of the HE STEM Set to Lead project. Please note they are interested in your responses regardless of whether you intend to find a job in engineering or technologist. The journal does not have any built environment specific paper this edition but there is a case study look at why women stay in stem (science, technology engineering and maths) careers and why others leave and a qualitive look at the barriers female PhD students in face in STEM disciplines. Staff at Southam based construction specialists Alumet have been collecting Christmas gifts for disadvantages families. Staff were supporting the Link Romania charity (reg number 1069722) which distributes shoeboxes full of gifts to poverty stricken families in Romania, Albania, Bulgaria, Moldova and the Ukraine. The boxes are full of items such as toiletries, sweets and toys, and are most likely the only presents the families receive at Christmas. Alumet's staff grouped together to fill 12 boxes which will be added to other collections across the country. Someone to organise and run two Technical leaders events each year. If you can help or know someone who can help in the above roles please contact the WES Office.